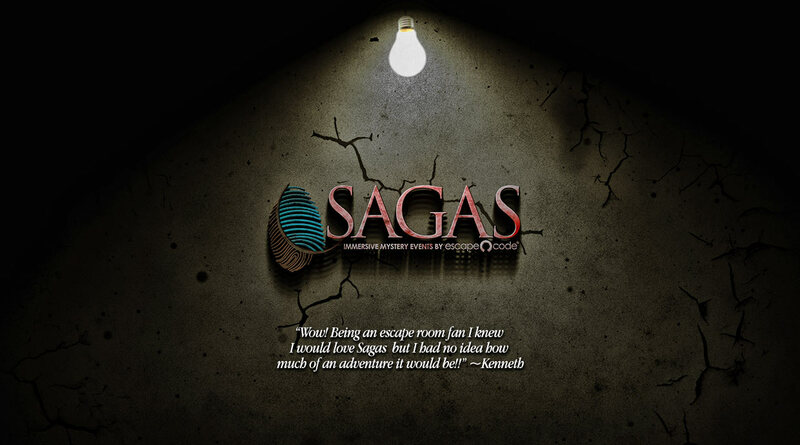 Sagas is a unique compilation of mystery theater and escape room entertainment. Whether you are looking for a fun team-building activity or you just want a little after-dinner entertainment, Sagas will prove to be an event to remember. The affair begins with delightful desserts as you mingle with your fellow sleuths. Then grab a flashlight, hunt for clues, discover secrets and solve puzzles as you rush to solve the mystery! Interact with actors as you move from room to room, but trust no one. There is a killer among you! Our first saga, The Windsor Heir, commences as you and your team are called in to investigate the murder of Charles Windsor, the wealthy beneficiary of the family fortune. Charles Windsor had countless enemies, but who would want him dead? With no wife or children, who served to benefit from his demise? It’s up to you to determine the motive, discover the murder weapon and hopefully catch a killer! Escape Code has been creating extraordinary escape games since 2015. We are excited to present our newest venture: Sagas! From his dramatic welcome until the mystery is solved, the Butler will be an important asset to your team. The Mechanic is a pleasant, cheerful person thrust into a difficult situation. Definitely get to know him. Don't cross the Gardener. He's mad at life and would rather be anywhere than in the middle of a murder investigation. The Maid stays busy tidying up, trying to help any way she can as teams investigate the murder. A deeply troubled man eagerly wants to meet you and your team. Don't worry, he's safely confined to a cage.